There comes a time when summer and fall merge together and we begin to lose it a little, and not because we're dreading the below freezing weather that follows autumn but because we literally don't know WTF to wear. When you're picking out an outfit in the morning, you don't know WTF to wear. When you go shopping, you don't know WTF to buy. When you decide to wear a "light coat" and realize it's still 80 degrees outside, you don't know WTF you were thinking. The weather is messing up everyone's steeze. If there's one item you should invest in for fall, I highly suggest purchasing a faux leather, badass-chic vest. Aside from getting your Son of Anarchy on, the moto vest is the perfect transitional piece that can be effortlessly worn through warm to cold weather. Not to mention, it can layered over almost everything — sweaters, shirts, dresses, and jackets. 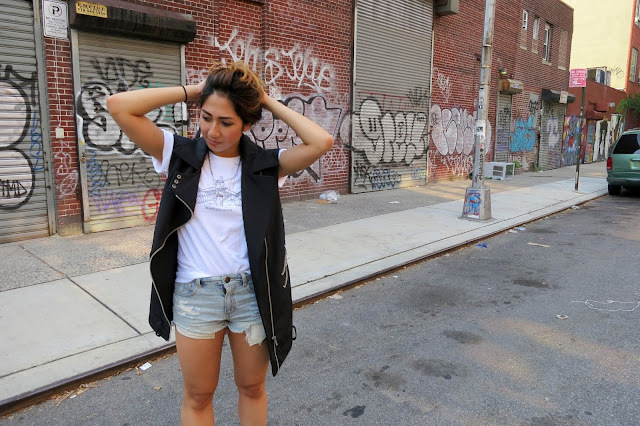 My favorite moto vest is from ifchic, which you can purchase during the #ifchic24 event on Monday, August 24th! I absolutely love this look! It's very chic. I am such a sucker for leather outerwear! I have a leather vest but I love oversized clothing so I need to find one like this. Very cute outfit and I am liking how you paired your outfit with chunky heels. Thanks girl! I'm a sucker for anything oversized and leather lol. Great minds think alike. You pull off the leather vest so well!